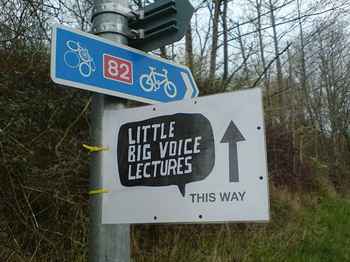 Earlier this year I went down to the Little Big Voice lectures that Howies put on and talked about using the internet to do communications and get your message out etc. While I was there Dave revealed that they were going to be opening a shop in Carnaby Street this Autumn and asked if I could think of any digital/community stuff that they could do with the shop. I immediately said No. But that I suspected I could rope in someone who could. So I managed to get Matt Jones involved (because he's also a Howies fan) and we sat and tried to think of some stuff. So we came up with a thing that we've been calling the flickrometer, inspired, very hugely by Schulze and Webb's social printer. But sillier. The simple version of the idea is this: there's a flickr pool where people put pictures that connect to Howies somehow. Canoe or bike trips they've been on. Great mud of our time. Good ideas for tshirts. You know the kind of thing. The folk in Cardigan Bay can contribute, everyone can contribute. And then, periodically, a clever software brain goes and grabs one of those images and makes a unique, one-of-a-kind, never-to-be-repeated postcard out of it. That postcard gets given to customers to treasure or to post, or it's used as part of the display in the store. Well, you can imagine uses for postcards. And, of course, you can also imagine, once you've got a postcard printing brain connected to images on the web, all kinds of interesting projects you could do with surfcams and the like. We'll get to those in a later post. The only big problem with that idea is it doesn't look very exciting. It's basically a printer. 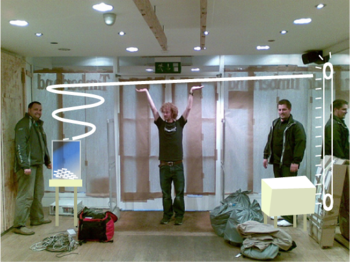 So, if it was going to work as 'retail theatre' we needed to give it some extra Heath Robinson / Tim Hunkin. So we envisaged a contraption that would deliver the postcards with the mechanical ballet of the breakfast machine in Chitty Chitty Bang Bang (designed by Roland Emett). We talked that through with the Howies folk and they said that sounds good, do that. Which is where Matt came up with his complete masterstroke - he suggested getting Henry Holland in to actually build the thing. And Henry is a complete ruddy genius. 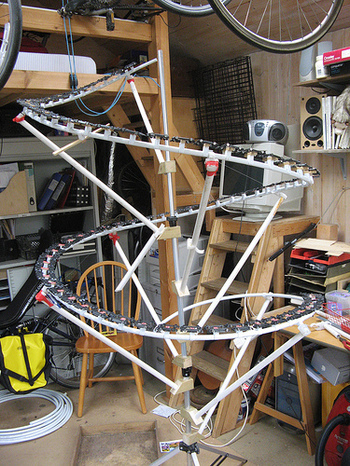 A proper boffin who can do the clever software stuff and the improvised contraption-y building bit. He's taking it from a fanciful idea into something really rather lovely. This is the inside of the Howies store (before they made it look nice) looking out. Ade, in the middle, is standing where the doors are. Either side are big glass windows. The plan is that the printer will sit on the right (where Henry is). It'll periodically switch itself on and disgorge a postcard which will be elevated by means to be determined but currently believed to involve old bike chains and a reclaimed washing machine motor to the ceiling where it will be deposited onto old Hornby railway tracks and will slide down, over the door, to the window on the other side. I really think it's going to work. You can see more work in progress pictures here. Which brings me to the reason for this post, which is mainly so Ade or someone at Howies can point to it with their blog. So they don't have to try and explain what we're up to. Because, over there, they're going to be asking people to start putting pictures in the flickr pool. If they'd like to. That's here. And, secondly, since we're struggling to come up with a proper name for the thing, they're going to be asking for suggestions, and, I think setting up a special email address for that. So, as soon as they've written their post I'll link to that. But someone had to go first in the mutual linkage. So, that's what this is. We're also wrestling with issues about printers, postcards and stock at the moment so we might come back to you with questions about those at some point, because I know there are some experienced postcard technicians out there. Anyway, that's the plan right now. More news soon. Oh I bloody love this. Really, really love this. Yep, this is fantastic, nice work. Genius, can't wait to see it in action. Joy. Can I have one? This sounds awesome Russell. It's a great way to be innovatively hip while incorporating online with offline AND making it an experiential moreso than an image campaign. This is an A+ idea. And sounds like you've recruited the right people to make it A+ work. I hope it goes smoothly. Good luck! You know what'd be nice, I reckon? Having a stamp machine nearby, or some way of hooking into the Royal Mail online postage-buying thingy. I never have stamps on me when I want them. This a good project that I like very much indeed. Yes, brilliant. Gold stars all round. Sounds like you have several fans of this idea! I don't have much to add to your Magic Postcard Machine, except that, of course. Very nice. russell, this is rad! and can i suggest that once it's all done, it most definitely needs a bell at the end. kind of like a typewriter ding, that resolutely says 'hi! i'm done!'. at this happened you said something about everybody joining in to make this. Is that still happening? can anybody come and play?